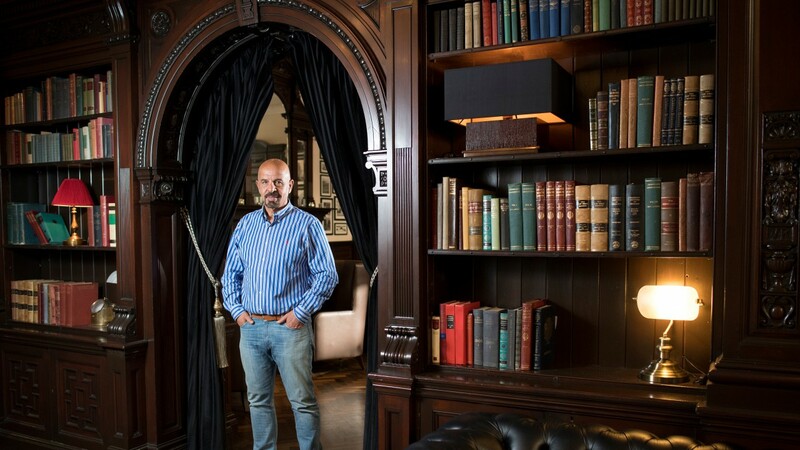 Lounging in plush, velvet-upholstered comfort in his very own hotel in the heart of Liverpool, Marwan Koukash looks anything but unhinged. What was once a down-at-heel relic of the city's former glory has been transformed into a showcase for restored Victorian grandeur and Koukash speaks proudly of it as his legacy, his "trophy in life". The Doubletree by Hilton hasn't been born long enough, however, for the uncomfortable memories of its conception and gestation to have faded entirely. Even in the lap of this luxury, there linger traces of the disbelief that accompanied the headstrong Palestinian's decision to take two wholly compatible, if rather dog-eared, age-of-Empire buildings and join them into a spectacular whole, with scant regard for the wholly incompatible office building that stood between them. "When I told him what I wanted to do, my architect said 'you must be ****ing crazy! '," recalls Koukash with the grin of a man for whom the tail-swishing of the learned professional classes acts as a goad rather than a deterrent. It was "a horrendous project" that took ten years, a whole heap of demolition and £30 million, but he built himself the hotel he wanted, and now we're sitting in it. The forthright 58-year-old leans back in his green velvet throne, clasps his hands on top of his smooth, olive-skinned head and allows himself a brief moment of the kind of satisfaction that comes from proving he can do what the doubters believe is undoable. "I was having dinner with the likes of Luca Cumani, Ian Williams and Richard Fahey," he explains, "and they asked me what my ambition was. I said to have 100 winners in a year, and I think it was Luca who said I was ****ing crazy. A lot of people probably think I am but it made me determined to do it, and in 2012 I did it." The balance of Koukash's mind seems to be a recurring theme, but for a man who was driven out of Palestine as a seven-year-old child, forced to hide in a cave outside his home village of Burin to shelter from hostile aircraft fire before walking for three days on shoeless feet to reach the sanctuary of Jordan, winning a hundred horseraces in a year takes on a lesser perspective. When he became a refugee for a second time, having been forced to flee Jordan for Kuwait three years later, he might have been forgiven for giving up the unequal struggle with the fates; instead he headed for Liverpool, worked his passage from impoverished student to billionaire businessman and became a celebrated part of the landscape of the region. After you've done all that, buying a failing rugby league club and promising to turn it into the finest outfit in Britain in an unfeasible space of time begins to look like less the act of a serial fantasist and more the dream of a relentless achiever. When he heads to Chester this week with a strong team of horses carrying the now-famous grey and gold silks, he will arrive as owner of the rebranded, high-flying Salford Red Devils and dyed-in-the-wool supporter of all things north-western. There was a time when he knew nothing about racing – just as he had to ask how many players there were on a rugby league team, even as he was walking into the meeting that ended with him buying the club – but in the past five years alone he has had 306 runners and 28 winners on the Roodee and has made himself as much a part of Chester as the historic track is part of him. "I didn't buy horses to make me a celebrity," he insists with the passion of a committed sportsman. "I bought them because I couldn't resist buying them and I enjoyed racing. It was the same with the rugby, I was travelling to Dubai minding my own business [it’s where Koukash has his successful corporate training company] and I happened to be sat next to a gentleman [by coincidence, RFL chief executive Nigel Wood] who recognised me from my racing, and he persuaded me to buy a club." Having bought Salford in the same way other people might buy a big Toblerone in the airport gift shop, Koukash never flinched in his mission. "I bought a club that was almost going out of existence and four years on we're only two points off the top of the league," he states boldly. "Like the hotel, it was a project most people would have walked away from, but you set yourself a target and you work hard towards it. I miss quite a lot of targets but every time you fail you put it down to lack of experience and from failure you gain more experience and you’re better prepared for the next time. Every time I fail, I'm a step closer to success." It's true that, contrary to appearances, Koukash isn't universally successful. When he first met local girl Mandy, now his wife, 25 years ago, she was managing the restaurant of a Liverpool hotel and he had just hit rock bottom. "I'd lost everything I had, literally overnight," he confesses with the candour of a man who has used hardship as a springboard to success. Now, however, his hotel's smart Koukash Restaurant is lined wall to ceiling with souvenirs of his turf successes. With rugby occupying much of his time at the moment, Dr Koukash, the electrical engineering PhD who paid his way through Liverpool's John Moores University as a waiter, mechanic, market trader and nightclub bouncer, has rather taken his eye off the racing ball of late, slipping from 101 winners and 714 runners in 2012 to just 21 from 288 last season, but it would be unwise to equate declining numbers with dwindling ambition. The passion that was ignited in Koukash when his bank manager suggested they go racing at Haydock together in 2007 is in no danger of becoming a damp squib, and it's unlikely that the childlike impetuosity that saw him buy his first horse immediately afterwards has dissipated either. "I got in touch with Ian Williams and said I needed him to buy me a horse to go back to Haydock with in three weeks' time," he recounts, in full awareness of the impression he must have created. "I found out that he called a friend of ours and said 'is this guy serious or is he taking the p***? ', but he bought me a horse who finished last in a seller, then I told him to go and buy me another one." Terminate, at Warwick on October 2, 2007, became Koukash's first winner with only his second runner, and he wasn't about to let the occasion go unmarked. "Mandy was watching Racing UK at home and she rang to tell me I was making a show of myself jumping up and down like that, and to tuck my shirt in," he smiles, ever conscious of, but not unduly bothered by, others' perceptions of his boisterousness. "I got over-excited but my love for racing went sky high – and it was never going to end there. "Ian bought me Bulwark as a horse who could give me a bit of fun at Chester, but I even had to ask him what Chester was, and so he explained to me about the Chester Cup." In the intervening years, the Roodee and Koukash have become almost synonymous, but back then there was only a passing acquaintance between the two, until the excitable owner backed his horse at 66-1 on the morning of the 2008 Cup and then joined the three-deep throng on the rails to watch the race. "I stood among the fans, where I couldn't see a thing," he says. "I heard his name quite a lot because he was last. Then I heard him moving up but I still couldn't see what was happening. When they passed the post, I asked one of the crowd what had won and he tore up his betting slip and said 'bloody Bulwark'. "You can imagine what I was like. Mandy's dad was watching on the TV and rang her to say 'tell Marwan to calm down, because he's going to have a heart attack'." Wins in the same big event came courtesy of Address Unknown (trained by Richard Fahey) in 2013 and Suegioo (Marco Botti) the following May. They may not have matched the Group wins of Our Jonathan, Masamah, Marcret or Mount Athos for prestige, but for sheer shirt-untucked enjoyment they remain unsurpassable for a man with such deep roots in the deltas of the Mersey and the Dee. He's not a native of the north-west, but becoming a local has come naturally, as did learning how to survive and thrive as a refugee in an alien country. War and tumult may drive a man out of his homeland, but they can also teach him valuable lessons about what is possible in their aftermath. "We farmed the land, grew what we could to feed ourselves, led a simple life with no TV or radio and no knowledge of what was going on in the world," he remembers. "Then all of a sudden the planes were overhead dropping bombs, and soon we had no country to look after us, so you have to look after yourself and education is the best way to do that. "Study was my way out of poverty into a better life and England was the best place to come and study. My father had done well in Kuwait and could afford to send me here, but I was only 17, I could hardly speak any English and I had to work hard to support myself. "I'm an ambitious person though, a risk-taker, and I had confidence in myself. Did I ever imagine being this successful? Probably not, but this is not through luck, it's through setting targets in everything I do." As the bright Merseyside evening turns to dusk over the nearby Cavern Club, the night is lit up by a fierce Twitter-storm concerning the Salford Red Devils. Rumour has escaped that the owner has well-advanced plans to rename them the Manchester Red Devils and relocate some of their home games to Old Trafford. Many fans have already vowed to shun the club for all eternity, but such polarising public opinion is familiar, almost comfortable, territory for Koukash. He may claim not to go looking for controversy, but controversy seems to have fitted a tracking device to his person and follows him everywhere. His latest capers include a weight-loss challenge with Leigh Centurions boss Derek Beaumont – for which he has already trimmed down from 19st to 15st 7lb and will soon strip to his shorts in front of 40,000 people on live television – and a charity boxing match with the same deadly rival. “I will beat the **** out of him,” Koukash has claimed on Twitter. A family man he may be – with children Layla, Lexi and Gabrial a big part of all he does – but a shrinking violet he is not. Throw in a recent appearance on Judge Rinder – in dispute with, you guessed it, Derek Beaumont – and you have a man whose approach to life is not so much direct as head-on. "I don't like political correctness and if I believe something I say it," he asserts, before turning his attentions back to his racing ambitions, by which some may be surprised. "I've got a yard of my own in Knowsley [Merseyside] and what I would love to do one day is to train a winner that I bred myself. If I hadn't become involved in rugby I might be training a few horses already, but I'll have the club where I want it within 18 months and then I can start to give a little more time to racing again. "I'll be buying some babies at the breeze-ups and in two years I'd like to start getting back to the level I was at in 2012, maybe not 100 winners a season but the 70 I used to have, with Chester at the heart of it." He sinks into the green velvet and surveys the jewel in the crown of the empire he has built. If he can create all this, it's surely not crazy to suggest he might one day train a racehorse to win a horserace. Just don't tell him he can't do it, or he will. 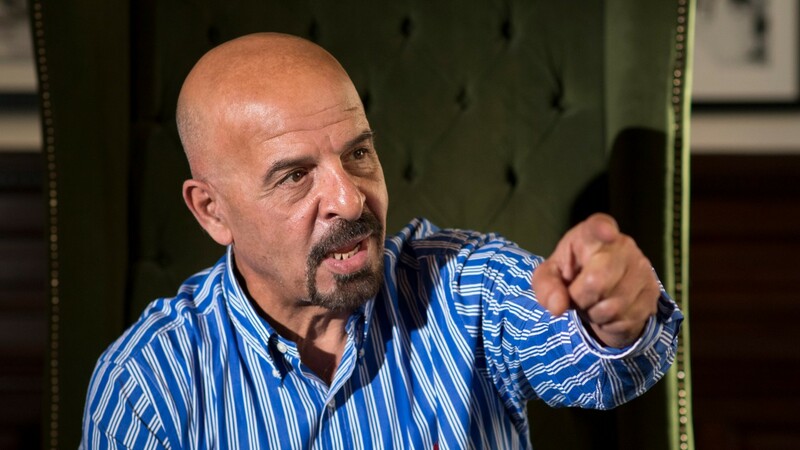 With the rugby league season in a state of high excitement and his Salford Red Devils firmly in the mix, Marwan Koukash could be forgiven for not being such a regular on the racecourse as before, but ask him if he'll be attending Chester this week and you'll receive a glare that suggests the alternatives are unthinkable. His team for the meeting may not be as big as in years gone by but he plans to have "15 or so runners in ten or 11 races" and will be launching a customarily strong challenge for the 188Bet Chester Cup. He has six entries, including past winner Suegioo, but one in particular is capturing his interest. "Angel Gabrial," he says, nominating the Fahey-trained 2014 runner-up. "He ran a good prep race at Musselburgh last month but he was desperate for it and I think he'll go very well on Wednesday, but the day I'm looking forward to is the Friday: no wife, no kids, go to the races and then be driven straight to the rugby for a game against Hull KR. "I even got the match delayed by an hour to be sure I could make it back in time for kick-off. Can I do that? I own the bloody club – of course I can do it!"